Preparation: Mix one glass of water with one litre of milk and bring to the boil. 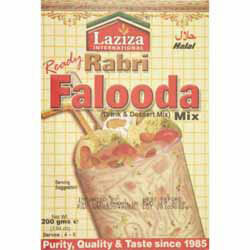 Add the Falooda mix and cook for 15 minutes, stirring at intervals. Cool in a refridgerator. Pour into glasses and top with crushed ice, or ice cream. Ingredients: Refined Sugar, Dextrose, Patent Flour, Modified Starch, Vegetable Fats, Raisin, Almonds, Pistachio, Basil, Cardamom, Pine Essence, Food Colours (E129, E133, E102, FD&C Red 40, Blue 1, Yellow 5).